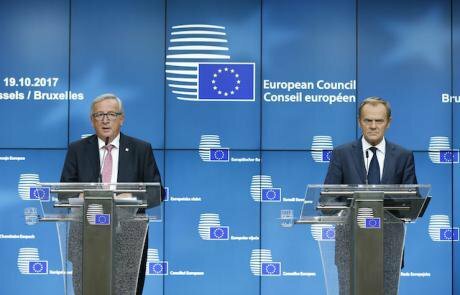 European Council President Donald Tusk and President of the European Commission Jean-Claude Juncker attend a press conference in Brussels, Belgium, on Oct. 19, 2017. Ye Pingfan/ Press Association. All rights reserved.OPEN LETTER TO COMMISSION PRESIDENT JUNCKER AND EUROPEAN COUNCIL PRESIDENT TUSK cc. First Vice-President Frans Timmermans on upholding the rule of law in the European Union. Yasha Maccanico, University of Bristol and "Statewatch"
If you would like to sign a version of this letter, please see the petition on Change.org.